Le vade-mecum du publicitaire allemand Julius Hermann Moritz Busch (1821-1899) Guide for travellers in Egypt and adjacent countries, translated from the German by W.C. Wrankmore, 1858, est un excellent exemple du guide du bien voyager en Égypte. Il est à la fois un résumé des connaissances (et erreurs d’interprétation) en égyptologie à l’époque de sa parution et une relation d'observations personnelles effectuées sur place par l’auteur, en bon journaliste qu’il était également. “From the Pyramids the traveller visits the Sphinx. Before he can see the face of this gigantic figure, which looks towards the east, he has a long and tiring walk, over large sand hills. The face, about 28 feet high, must have once looked proudand beautiful from between the striped headdress, but now it is mutilated, and the nose and part of the cheeks are missing. It is plainly to be seen that the figure was once painted a red-brown. Mariette's excavations in 1852 have rectified many of the former opinions about this Sphinx. 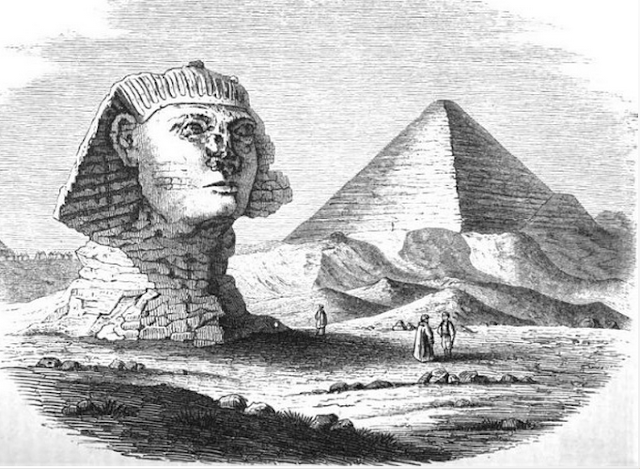 The researches of this indefatigable investigator have proved that the Sphinx did not rest on a pedestal, although the Egyptians always represent it on one, and also, that it does not denote the original height of the upland, on which it lies, because it has never been hewn out. The Sphinx is, even to the head, where the operation of the chisel is plainly discerned, a natural rock, a gift of nature. This, the Greek inscriptions, found in the neighbourhood, point out, by stating that the gods had formed its body. The neck is the natural rock with its cracked layers, and its immense oval body is also but little hewn. But the resting front-paws were completed by large blocks, and in other places the holes in the rock were filled up with stone-work. Between the front-paws and breast is a small temple, the back-wall of which is a slab rounded off at the top, on which Thotmes IV offers sacrifices to the Sphinx. The different names given to the Sphinx on the slab, leave no doubt as to what it was to the Egyptians. It was the image of the god of the sun. The second part of the inscription is very much mutilated, but the speech of the god to the king is pretty well preserved. The latter part of the name of a king is discernable, which, according to a table, published by Lepsius, can only be ascribed to king Chafra. The following words are also still legible: "Made the picture of Tmu, Har Em Ashoo" (Tmu or Atmuis the setting sun, Har Em Ashoo, the god of the horizon). From this it has been inferred that the builder of the second Pyramid was also the erector of the Sphinx. Thotmes IV may have repaired and improved the temple. In conclusion it may be remarked that the length of the Sphinx, from the points of the paws to the beginning of the tail, is not, as was stated by Caviglia, duly 143 feet, but 172½ feet, and that the Arabs name it the Lion of the Night (Saba El Lejl). Mariette's excavations have led to another important discovery, which is now unfortunately again covered with sand. In front of the Sphinx he found a paved dromos leading to a large wall, which seemed to have formed a court round the Sphinx, and through which a gate opened to a temple on the south side. Mariette came to the stone pavement 24 feet beneath the top of the wall ; but the gate was still much deeper, and could have led only to some subterraneous apartments under the pavement. After entering the gate there is a passage 18 feet high, and 7 feet wide, which inclines gradually under the enclosing wall.